The announcement of 75192 Millennium Falcon met with a response of unprecedented excitement on the 1st of September and its release, which took place just a couple of weeks later, proved the sheer magnitude of fans’ anticipation as the set sold out online and in stores within a matter of minutes. When was it decided that a brand new Ultimate Collector’s Series Millennium Falcon would be designed for the fortieth anniversary of Star Wars? What can you tell us about your history within LEGO and the LEGO Star Wars design team? Working at the LEGO Group for almost 10 years now, I joined the LEGO Star Wars team more than 3 years ago. The first set I worked on was – a Millennium Falcon! 75105 from The Force Awakens became hugely popular and even won a “toy of the year award”, the equivalent of an Oscar in the toy industry. As to how I scored this job in the first place, well – while working on a different LEGO product line, I was entrusted with the design of a Star Wars UCS set, the well-received 75060 UCS Slave I. Later, when there was an open position on the Star Wars team, they sent bounty hunters to pick me up! Did you feel a particular sense of responsibility when designing the largest LEGO set ever? Designing the largest LEGO set ever was not something I had on my mind initially, or set out to do. But after working on it for a while it slowly dawned on me that it would indeed be that, the biggest LEGO set ever sold. There was one memorable day pretty early on when the piece count surpassed a previous record holder, 10189 Taj Mahal, (5922 elements). But as you know today, it didn’t stop there, and the goal became bigger than reviving a vintage LEGO set. Also, it is the Millennium Falcon, one of the most iconic ships ever. So yes, there was some pressure to get it absolutely right, but most of the pressure was self-imposed by a perfectionist approach. I consider this task my own version of Han Solo’s famous Kessel run! LEGO products often involve a great deal of collaboration between designers. To what extent did other members of the Star Wars team contribute to the creation of this set? The LEGO Star Wars team is extremely busy these days so even on large tasks there is usually only one designer assigned to a set. 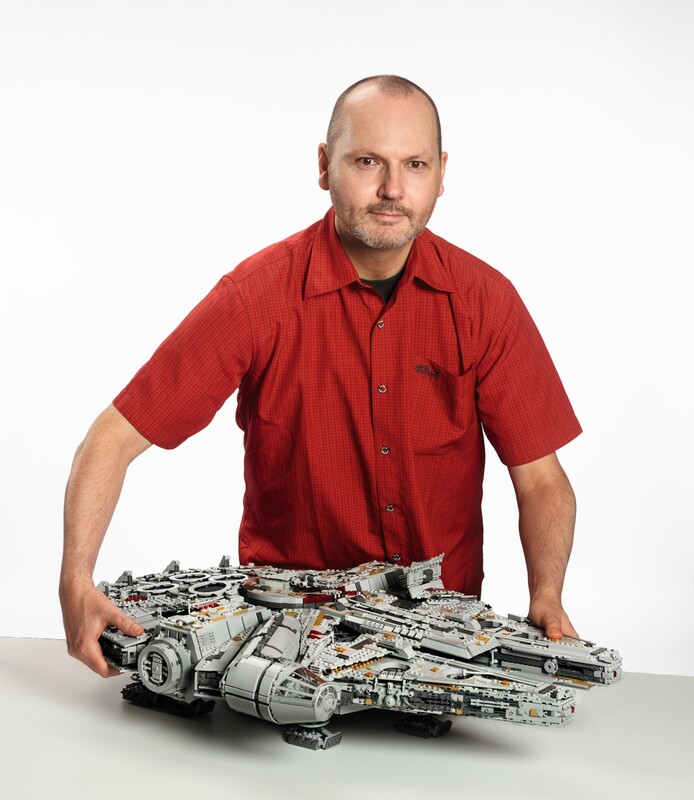 In this case it was me, chiselling away at this new UCS model for about eight months. Not in solitude, however! At LEGO, we are used to working as a team. Designers look at each other’s models regularly and share ideas. When a designer runs into a problem, we are not left alone. This is very reassuring when you are responsible for designing a set that will be sold all over the world! What challenges does designing such an enormous set present? One word: space! Our working desks at LEGO seem huge, but they quickly fill up when you put computer equipment on them, add some concept models and bins of other stuff and LEGO elements. Then try to find room on the desk for even just one copy of the UCS Millennium Falcon to continuously work on! Fortunately, I am used to working with digital LEGO design tools on my computer. This allows me to apply changes much more quickly and easily than in the real world. It also drastically reduced the amount of copies I had to build to document changes and improvements. But while this greatly helped, there were challenges that couldn’t be solved in the digital realm only – like how to deal with the tremendous weight of this particular model! Did choosing to include an interior cause any issues relating to the stability of the model during the design phase? Not at all. There were open spaces in the internal support frame of the older UCS Falcon already, which I used for a start. It was a matter of moving all the LEGO Technic beams further apart to make some more space. Not as much space as I would have liked, but just enough to put in every interior feature seen in the movies that I thought the Falcon should have. What kinds of reference material did you use when designing the set? There are many pictures of awesome fan-created studio-scale models on the internet, but it is important that we designers stick to official reference material, like pictures of actual movie props from the Lucasfilm archive, and use other sources only for inspiration. Eventually, our product needs to be approved by Lucasfilm – and they always look very closely at every detail. Did your experience designing 75105 Millennium Falcon have any impact upon the creation of this Ultimate Collector’s Series set? Due to their vastly different sizes, both models have less in common than one would think. One detail from 75105 that made it into the new UCS however are the trans-blue flex tubes used for the sublight engines. They also share a LEGO Technic frame providing stability. But while on 75105 the frame is under the model (allowing for an interior), on the UCS version it is hidden on the inside. What inspiration did you take from 10179 Ultimate Collector’s Millennium Falcon? Since 75192 is based on, and started off around the frame of the older UCS Falcon, I definitely took more than just inspiration from 10179! I even kept the way the hull panels are attached, because it still made sense to design the set this way. Were there any aspects of 10179 Ultimate Collector’s Millennium Falcon that you were particularly keen to improve upon when designing 75192 Millennium Falcon? In my eyes 10179 still looked good even after so many years, but there were opportunities for upgrades, like making everything even more accurate, making everything round that should be round, ramping up the level of detail and greebling, putting in some interior and generally be a little more courageous with colors. All of this using the latest elements, of course. I am especially happy with the new windscreen element we made. LEGO Star Wars: The Visual Dictionary revealed that 10179 Ultimate Collector’s Millennium Falcon was designed before being assigned a price, inverting the usual design process. Was the same process applied to this set? Correct, Jens Kronvold Frederiksen designed 10179 on his own and it then became a set! Developing a product portfolio is complex and involves a lot of planning, which makes it difficult for designers to push their own side projects. What aspects of the set are you most satisfied with? I am very satisfied with the exterior and the way the interior can be accessed without having to remove entire hull panels. I am also happy our team went along with my Episode V direction in terms of minifigure design (respirators!) and box art. Is there anything that you wished to include but were unable to do so? Not really, no! Well, maybe more Mynocks? How did you decide upon which characters to include from the Original Trilogy? Usually it is not up to the model designer to build a minifigure line-up, but again UCS sets are special. For example, on the UCS Slave I only Boba Fett was supposed to come with the set. However, I figured a Stormtrooper and a Bespin guard would really round out the set nicely so we added them in! With the UCS Millennium Falcon we didn’t want to include any super-exclusive minifigures. The set is not really about the minifigures, anyway. The Millennium Falcon underwent numerous alterations between the Original and Sequel Trilogies, the most notable being the new rectenna and the more powerful tractor beam projectors on the mandibles. Did you consider including any of the subtler changes? There are indeed other differences between the Classic Trilogy Falcon and the Falcon from the Sequel Trilogy but most are fairly minor and don’t stand out. I didn’t want to add too many details that would have to be swapped when reconfiguring the model between Episode V and VII, so I took a middle of the road approach and just kept what I thought made sense and looked good. The piece count of 7541 elements far surpasses that of any previous LEGO set. Do you think there is the potential to produce even larger sets in the future? There are always limiting factors when designing a LEGO set. With the Falcon I think we have reached a limit to what could be done in terms of weight and stability in a LEGO Star Wars set, so I hope we can keep this new record for a while! Many thanks for taking the time to speak with us! Hans diligently maintains a BrickList of his work which you can view here. 75192 Millennium Falcon is currently out of stock at shop.LEGO.com and in LEGO stores but we will let you know as soon as additional stock is released. In addition, we will soon be publishing the final part of our review, covering the completed model and its accuracy to the source material, so keep an eye on the homepage for that as well as more reviews of the remaining Star Wars: The Last Jedi products. LEGO Double VIP Points & lots of freebies!